Reflecting on the person she was at age 17, Sister Jane Hibbard wonders at God’s sense of humor and incredible grace in her call to religious life. Born and raised in Eugene, Oregon, the oldest of four siblings and the only daughter of Margaret and Webster Hibbard, Jane attended St. Mary’s Grade School and St. Francis High School (now Marist). Education, in the formal sense, was always a challenge and she was accepted into the novitiate because “she has such a wonderful mother.” Her three brothers, John, Dave and Joe and their families continue to be the deepest of loving relationships. Jane’s parents were the foundation of love, joy and caring for others that have infused their lives. The Holy Names Sisters were expected to teach after they graduated from college, and Sister Jane was sent to Bend, Oregon, where teaching the primary grades and living with wonderful Sisters of the Holy Names brought many lasting relationships. The call to be an elementary school principal was unexpected and proved to be a good match for the gifts in ministry Jane had been given, first back in Bend and then at Holy Redeemer School in North Portland. Those were turbulent years in Portland and in the neighborhood. Living at the convent, with nine other Holy Names Sisters and working in tandem with a dedicated faculty, it was a positive and enriching 16 years. Responding to discernment for leadership, at the time of the founding of Mary’s Woods at Marylhurst, a whole new vocabulary and sense of graced collaboration came into play. 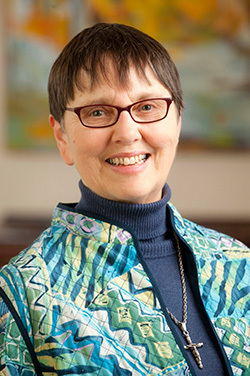 As a leadership team, Jane and the other team members worked with the Sisters as first they relocated to Portland and then moved back to Marylhurst, welcoming the new and expanding community to the Marylhurst campus. As her call to leadership extended to the reconfigured province of four former U.S. and Ontario, Canada, provinces, she became acquainted with Sisters all over the United States and Canada. It was a very challenging and enriching five years. All is good and all is gift. Jane is amazed and eternally grateful for these 50 years, for all the people who have enriched her life, and looks forward to the continuing journey.